I was absolutely terrified when it was time to cook my first Thanksgiving. My husband is from a big family with that one, goddess-like matriarch that spends three whole days (literally) before every Thanksgiving cooking, preparing, stuffing, marinating, basting, and all those other masterchef-type-adjectives that I'd have to Google how to even pronounce, not to mention perform. Then, one fateful year my husband had to have a major back surgery and our ability to fly across the country to said goddess-like, kitchen wizard went out the window and left me in the hot seat. Given my potent grasp of my lack of experience in the kitchen (paired with an almost super-human sense of self-deprecation) I set my goals for my first Thanksgiving pretty low: dear Lord, please don't let me murder anyone with uncooked turkey. I'm pleased to say that this goal was accomplished. As a matter of fact, if you ask my husband the turkey was actually really good. No idea how I pulled it off, but I successfully survived without anyone dying or calling me out on not being Jesus' gift to the culinary arts. Whew. So...Maybe All the Food Should be Hot Simultaneously? So after my first Thanksgiving went by without a visit from the CSU, I noticed that the hardest part of cooking wasn't getting the food to come out tasty. That was difficult, but anyone with the ability to Google things, read what the online recipe says, then follow the directions should be able to make one dish turn out right. The hard part was making sure all the different dishes came out at the same time. Basically, all the pieces were in place, but they didn't fit together quite right. Being my nerdy, list-making, over-organized self, I immediately began scheming, color coding, and plotting what I should do differently should I ever be asked to perpetrate Thanksgiving again. Shop a few days ahead of time so that all the Thanksgiving stuff is in one place (usually clustered around all the frozen turkeys). Too soon and you have to hunt through the normal aisles to find everything, too late and stuff is already gone. The shopping sweet spot (for my grocery store) was 3 - 5 days before the actual holiday. It is perfectly acceptable to use the recipe on the back of the stuffing box/cranberry bag/whatever. No one will ask if it's your great grandma Fifi's recipe that she smuggled out of the war in her hollow wooden leg. They just want edible stuffing. Find a turkey recipe online before you even shop because the recipe impacts the weight of the turkey, the cooking time, and (most importantly) the defrosting time. You do not want the arm workout of holding a semi-thawed turkey under hot water at 8:41am on Thanksgiving morning trying to thaw the giblets (fun word, scarring reality) out of the neck cavity (world's least appetizing phrase). After you do your shopping, grab all your recipes (most of which are printed on one of the ingredients, like stuffing, cranberry sauce, or cornbread) and make a reverse timeline. I'll go into detail on the art of the reverse timeline in the next section. Let your family know what time the food will be served. Let them know (politely) that this is nonnegotiable and that, should they want food, they should arrive before that. The last thing you need is to try to adjust your plan on the fly because one of your jerk relatives can't tell time. Don't let people freak you out. My husband is fond of asking me "shouldn't you be cooking?" as soon as we wake up on Thanksgiving morning. (He does this with love and out of concern for my meal not turning out badly, not to see if he can make my ears smoke.) I have no idea what his domestic goddess aunt does, but the online recipe I downloaded gave me very specific timelines. Trust the internet and don't succumb to panic. So here's where you really get your merit badge. When you're sitting down with all your recipes, you want to put them in order from most important thing (e.g. turkey, gravy, etc.) to least important thing (e.g. green beans, that weird cranberry sauce only Uncle Joe ever eats, etc.). This is so you put the most attention on the things your guests really care about. Grab a piece of blank paper (or on my handy dandy free downloadable Thanksgiving battle plan) and prepare to make a chart. You're going to make one column for each food you plan to make (aka turkey, stuffing, gravy, etc.). These columns will house all the steps for preparing that specific food. Each step you list on the chart, will be assigned a time you have to do that step. Simple enough, right? This is a screenshot of the free downloadable Thanksgiving battle plan I keep talking about, just to give you a visualization. Basically, each column has the steps for one food, the bar down the left represents your timeline. The first piece of information is when you'll be setting the food on the table. This is pretty obvious. If you want all your food ready at one specific time, you probably need to know when that time is going to be. Now that your basic schedule has been created, it's time to get to the "fun" (read: planning yay!) part. I'd start with your turkey. Look at whatever recipe you chose and examine the steps one by one in backwards order, starting from the time it says to carve the turkey. Write that last step on your plan at whatever time you have as "food o'clock". In our example, this means I'd write "4:00 Carve Turkey" in my "turkey" column next to the very bottom tick mark (the one I labled 4pm). Next, go to the second to last step and figure out what time that would have to happen. In our example, it's probably taking the turkey out of the oven and letting it rest for 30 minutes, so I'd go to my turkey column about half-way between the 3pm tick mark and the 4pm tick mark and write "3:30 Take Turkey Out of Oven". Great. Now do that for all the steps in the rest of your turkey recipe. When you're done, the plan should be a step-by-step timeline that mirrors your recipe exactly as you read down the "turkey" column of your battle plan. Now, you get to do this for each individual food item (e.g. stuffing, gravy, potatoes, etc.) you plan on making. After you have your whole battle plan laid out, go over it one more time. This time, instead of reading one column at a time, look at it chronologically. For example, here's all the crap I have to do at 9am, then at 10am, and so on and so forth. As you go, double check for things like preheating ovens (and making sure you know which food goes in what oven, at what time, and at what temperature). If you have two ovens and three temperatures, you might want to make some adjustments now. Similarly, make sure you don't have any crazy periods of time where you're scheduled to do key steps on three different food items at once. (For example, make sure you don't need to make your gravy at the same time as you're supposed to be basting the turkey.) If you do have any overlap periods that might require you to grow an extra arm, try picking whichever food retains heat the best (aka can come out a little early without being disgusting by the time you eat) and move it 5-10 minutes earlier on your schedule. For instance, veggies lose their heat pretty quickly, but mashed potatoes stay warm forever, especially if you leave them covered. If there's a conflict between these two, I'd move the mashed potatoes 10 minutes earlier so there's no overlap. Once you've made and double checked your battle plan, your actual day of cooking should be busy but not chaotic. All you have to do is check to see which steps need doing at whatever time it happens to be and follow your battle plan like a GPS. If you have an amazing digital assistant of the future (which I could not recommend more strongly) you can even program in reminders that will tell you what steps to do at what specific times. Talk about cooking in the future. Overall, the goal is to be well enough organized that you get to stress less about cooking (or in my case about potentially poisoning everyone you love) and more about spending time with your family. 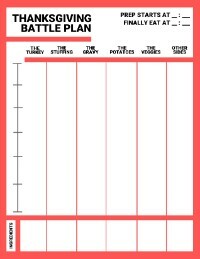 Now go get that downloadable Thanksgiving battle plan and let me know how you like it! Let me know in the comments how it worked, what you cooked, and what crazy things your family did while you were slaving away over a hot turkey.